hi would you have one please ? Thank you for your email. I'm afraid we have not got the ink for this printer at the moment. We only appear to have the franking labels at present. I am unsure whether we will be getting these back in. I do apologise for the inconvenience. The Neopost IJ-60 is an excellent desktop solution for bulk mailing tasks. It is one of the most powerful franking machines in this range, capable of processing as many as 110 letters per minute. The IJ-60 Neopost printer even adds another 50 department IDs, which makes tracking and managing the postal costs of up to 150 departments much easier. The Neopost IJ-60 franking system can be directly connected to a PC for exporting reports and mailing data, while giving offices the capability of stamping their own mails with personalised slogans, messages and even logos. Better media handling would improve the performance of this unit, and additional weight capacity would not hurt as well. The Neopost IJ-60 franking machine is really simple to operate, thanks to its soft-touch controls and mid-size LCD display. The IJ-60 printer has PC interface for transferring data and reports, and has an integrated 70-pound capacity scale, which makes automatic calculation of postage possible. The Neopost IJ60 franking machine prints on labels and envelopes, and uses long-lasting IJ-60 ink cartridges, ideal for those with bulk franking needs. In addition to its rapid processing speed of 110 lpm, the Neopost IJ-60 mail processing system also boasts reduced costs because of postage waste, low costs per impression, and increased productivity, as the IJ-60 machine does not need that much operator intervention. Expandable features are at hand for growing office needs. The Neopost IJ-60 inkjet printer is often criticised for poor media handling and low media capacity. 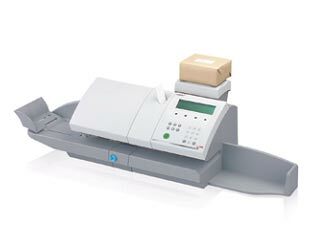 Still, this franking machine is a good solution for bulk mailing needs.